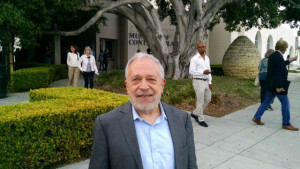 Former Labor Secretary Robert Reich said Monday he is fundamentally optimistic for the future, even though inequality is a significant and growing problem for America. “I look at history and see that every time our own system of capitalism has gone off track we put aside ideology…and very pragmatically get on with what needs to be done,” he told a crowd of 400 at the Museum of Contemporary Art San Diego in La Jolla. Reich, labor secretary under President Clinton and now a professor at UC Berkeley, said it is hard not to be optimistic when he teaches some of the best and brightest young people. He was in San Diego for a screening of his 2013 documentary “Inequality for All” sponsored by the San Diego Foundation Center for Civic Engagement and the UC San Diego Blum Cross-Border Initiative. After the film, he took questions from the audience for more than 30 minutes. The documentary draws attention to rising income inequality in America and the danger that poses to a democracy based on equality. Minimum wage — Putting more money in people’s pockets has a multiplier effect, so raising the minimum wage will create jobs. Immigration — The economic data shows that immigrants benefit America. Moreover, immigration will help America avoid the trap of an aging population that faces China, Japan and Europe. Anti-trust law — This is really pro-competition, because it prevents monopolies and oligopolies from crushing startups. The Center for Civic Engagement is attempting to facilitate dialogue and collaborative action in the San Diego area while the Blum Initiative promotes research into poverty in the San Diego-Tijuana region, the largest bi-national metropolitan area in the world.